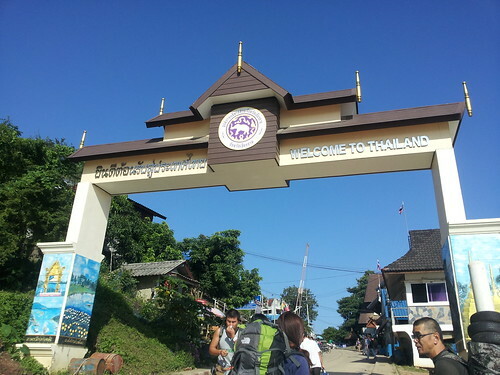 We had a couple of options for getting from Luang Prabang, Laos across the border to Chiang Mai, Thailand and were struggling to make up our minds. Flying would have cost us nearly £200, so well out of our budget, although would have only been a 1 hour flight. Our second option was to take the Slow Boat which takes 3 days / 2 nights involving stopovers in a couple of towns along the river. We had been told that if you had the time this was a good choice as it offered beautiful scenery and was a very relaxing way to do it. However the prospect of two 9 hour days on a boat, then arriving somewhere and having to rush around to find a guesthouse (plus the prospect of me feeling sick on the boat) put us off! We opted for our third choice which was the overnight sitting bus (not comfy recliners or beds here!) 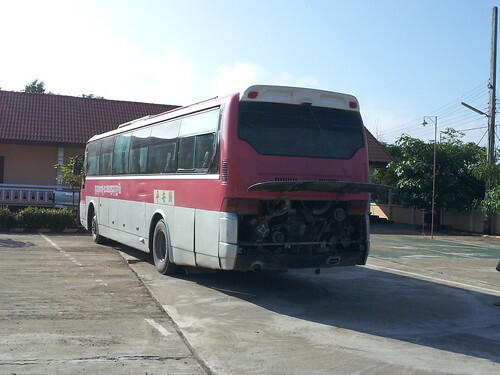 which was one bus straight through to Chiang Mai and would take 17 hours. Although the prospect of that long sitting on a bus was not appealing to either of us, it was our cheapest and best option, (300,000 Kip each) so at 17:00 we were picked up from our hotel and taken to the bus station. We checked in, but had about 40 minutes to wait for the bus and killed time by chatting to some other travellers who were heading to Ha Noi, Viet Nam. However as 18:00 drew closer there was still no sign of our bus, and the lady behind the counter was starting to look stressed before we were ushered us and four others into a tuk-tuk and taken to the other bus station on the outskirts of town - hmmm, something was up! We arrived at another bus station to get a local bus, we weren't told this just put on and given new tickets. A hour and a half later we finally set off on a full bus which was cramped and smelly and sounded awful when changing gears. We actually managed to get some sleep and the bus only broke down twice with them pulling over and getting in the engine to fix it. Then 13 hours later we were at the border town and everyone was ordered off. We were then asked for our original tickets (which luckily we kept) and the 6 of us were put, yet again, on another tuk-tuk and not told where we going (we were being very trusting, but thought if we stuck together we'll be fine). After a 10 minute drive we arrived at a guesthouse/bus depot and given stickers (which said “Boom House” randomly) and told by a lady that she would see us at 09:00 (it being 08:30) to help us cross the border. The tuk-tuk was off again dropping us off at a port/immigration and pointed us down to the water. Standing around we decided we to “check out” of Laos getting our passports stamped and waited for our random lady to return. Surprisingly she did in only a few minutes and ushered us on to a small boat over the Mekong to Thailand. Once at the other side she passed us over to a man with a van and said goodbye. Our driver who could speak great English and Chinese told us to go to the immigration window to get our free VOA (Visa On Arrival). This was actually very straight forward, just a small form to fill out and then you get a stamp with an exit date and some how we managed to get 30 days. All with our visa’s sorted we were taken to a pickup truck with two more passengers and had to put all our bags in the back, it was then we realised their were only 5 seats, the 5 men would have to sit in the back on the bags while us 4 girls got to go inside the cab. Just 10 minutes drive and we arrived at the Boom House guesthouse (now the stickers made sense) and told to wait for a minibus. After a little confusion about whether the bus would go to Chiang Rai first we finally set off in an amazingly comfortable minibus. By 16:00 we arrived at Chiang Mai only 3 hours late! Managing to get a free tuk-tuk to the centre of town, we then had to walk 20 minutes to our hotel in extreme heat! By the time we arrived it was 17:00 making a journey exactly 24hours!!! !